Baroota Pumped Hydro Project will provide large scale energy storage to South Australia’s electricity network, storing energy when supply is high and releasing energy when supply is low relative to demand. The Project is being designed for between 200 and 270 MW of capacity and storage for up to 8 continuous hours of generation, providing a new supply of electricity during peak periods of daily demand. 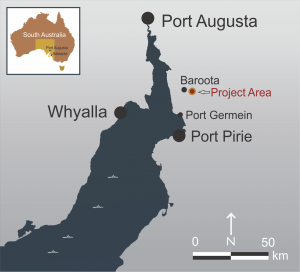 Located 40 kilometres north-east of Port Pirie, the Project is strategically located among the Mid North’s many existing and proposed wind and solar energy projects, and within 1 km of an existing ElectraNet 275kv transmission line. Baroota Hydro Project will store excess energy generated from existing and new renewable energy projects enabling the Mid-North to become a critical source of low cost reliable power to South Australia. 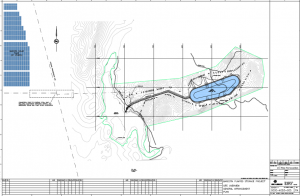 What is Pump Hydro energy storage? 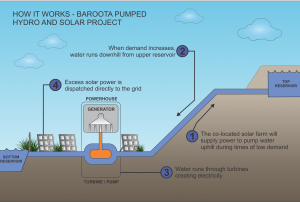 Baroota Pumped Hydro Project stores energy by pumping water to an upper reservoir and then generates electricity by releasing water to a lower reservoir through generation turbines. The two reservoirs provide a closed loop system, recycling water and generating electricity as water is moved between the reservoirs. Large capacity energy storage is the missing link in South Australia’s power system. Pumped hydro is uniquely placed to fill this gap by storing excess energy at large scale when other forms of renewable energy, for example wind and solar, are abundant. Because of its size, pumped hydro can provide continuous dispatchable power over many hours helping to provide a more reliable and low-cost electricity network. Pump Hydro is an important opportunity for South Australian energy security. – Dr Alan Finkel, Independent Review into the Future Security of the National Electricity Market. Baroota Pumped Hydro Project creates a new purpose for the existing Baroota Reservoir (lower reservoir) which ceased to be an active part of SA Water’s network in the 1990s and involves the construction of a new (upper) reservoir, water conveyance system, powerhouse and transmission infrastructure. The Project has the potential to be integrated with the co-located Bridle Track Solar Project for direct solar electricity supply for water pumping, and to share transmission connection.